American nuclear stockpiles: down some 85% from a peak of 31,255 warheads in 1967. The United States maintains a nuclear stockpile of 4,650 deliverable warheads, a reduction of 260 warheads from last year, according to the Bulletin of the Atomic Scientists’ 2013 Nuclear Notebook. The new update, written by Hans M. Kristensen and Robert S. Norris, also notes that the U.S. has reduced its active nuclear stockpile by 560 warheads since September 2009 when it stood at 5,113 warheads. Last month Kristensen wrote that the current U.S. stockpile was down some 85% from the peak of 31,255 warheads in 1967. In Nuclear Notebook the authors estimate that of the current stockpile of 4,650 warheads, 2,150 are operational. 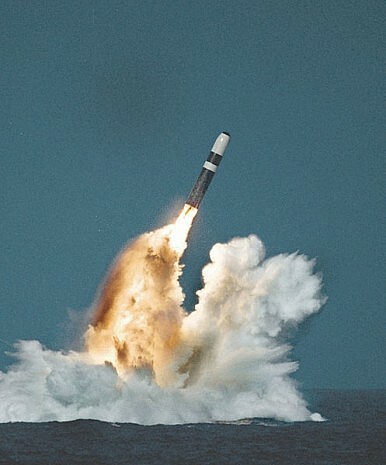 1,650 of these are strategic missiles located on 800 ballistic missiles, with roughly 1,150 being on sea-launched ballistic missiles [SLBMs] and the other 500 being on intercontinental ballistic missiles [ICBMs]. Kristensen and Norris also estimate the U.S. has approximately 300 additional strategic warheads located on bomber bases within the United States, and nearly 200 non-strategic nuclear missiles forward deployed in Europe. “The remaining 2,500 warheads are in storage as a so-called hedge against technical or geopolitical surprises,” the authors write, before noting that another 3,000 retired warheads are still intact, waiting to be dismantled. When these 3,000 warheads are included the size of the U.S. nuclear weapon stockpile is approximately 7,700 warheads. Under the terms of the New START Treaty that the United States signed with Russia in 2010, the U.S. stockpile must shrink to 1,550 strategic warheads over the course of seven years from the time when the Treaty entered into force. The actual figure can be higher, however, because a provision in the Treaty allows for the two sides to count each deployed heavy bomber as one warhead regardless of how many it actually carries. Furthermore, the New START Treaty does not set a limit on non-strategic (also referred to as tactical) nuclear weapons, which Russia in particular has come to rely on as its conventional military capabilities have declined since the end of the Cold War. There have also been reports that the administration is considering making sizeable, unilateral cuts to the U.S. nuclear stockpile as a means of cutting defense spending. Specifically, the New York Times reported that the White House was considering cutting the U.S. arsenal to just over 1,000 deployed nuclear warheads. During his State of the Union address last month the president also said that his administration was committed to seeking further nuclear reductions with Russia. Last month Joe Biden reportedly met with Russian Foreign Minister Sergei Lavrov to discuss new talks aimed at inking another nuclear reduction agreement. National Security Advisor Tom Donlion has said he will soon travel to Moscow, likely to discuss the same subject with Russian officials. Zachary Keck is assistant editor at The Diplomat. You can find him on Twitter: @ZacharyKeck.